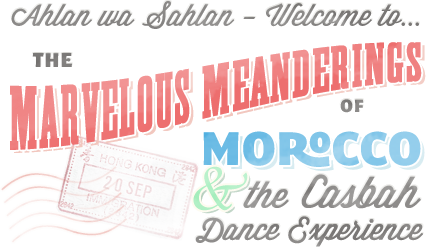 Every August dancers from around the Southwest gather in the heart of the Texas Hill Country for a perfect gem of a seminar. Combine the verve and charm of Austin with a tightly woven package of first-rate entertainment and instruction, and you have Bahaia’s Heart of Texas (H.O.T.) Seminars. After six years as a performer, Bahaia’s first foray into the seminar business began in 1996 at the recommendation of Bert Balladine. The result was Athens Meets Austin with Rhea, who had inspired Bahaia during a 1993 trip to Greece. Bahaia’s efforts were a success, thus opening the door to further adventures in seminar production. My first three-day workshop was the 1997 H.O.T. Seminar featuring Fat Chance Belly Dance of San Francisco. The strength and simplicity of their American Tribal style was Bahaia’s motivation for bringing them to Austin. To this day, it stands as one of the most substantive and engaging workshops I’ve ever attended. The shows were equally exciting, each attracting significant crowds. The Saturday night show alone pulled in a whopping 375 people, an all-time record for the show’s venue, Austin’s Scottish Rite Temple. Impressed by Bahaia’s professionalism, keen business sense, and her high standard of quality, I didn’t hesitate to pre-register for her 1998 seminar with Morocco. On the weekend of August 14 – 16, ninety-five participants descended on Austin’s Chariot Inn for the 1998 H.O.T. Seminar featuring Morocco. Greeted by very helpful assistants at the registration desk, attendees bought seminar t-shirts and received registration materials complete with information on the Austin area, as well as complimentary tote bags for early registrants. With feigned fortitude, I tried to ignore the bevy of vendors offering an array of wares, without much success. The variety of goodies ranged from antique tribal jewelry to the most glamorous of cabaret attire. By the end of the Friday night show, I suspected that my expectations for the weekend would be met, if not exceeded. Instead of the often feebly-attended Friday night performances we’ve all experienced from time to time, Bahaia packed in a crowd of 170 people for a live music extravaganza featuring Houston’s Trans Arabian Sounds and some of the regions most celebrated dancers. Together, the musicians and dancers graced a raised stage, tastefully accented by large plants and bordered on three sides by a very spirited audience. A few of the evening’s many highlights included an elegant performance by Oklahoma City’s Shadia Dahlal, notable for her confident fluidity. Fort Worth’s beloved Miabella, who had twenty students in tow for the weekend, exuded a friendly sensuality in a crowd-pleasing performance. Students of Austin’s Almaazah performed a troupe choreography to an original piece from Star Dance, Vol. III, a courageous feat considering the spontaneous nature of live music. Lastly, the evening’s guest star, San Antonio’s Karen Barbee closed the event with her usual eye-popping precision. The live music, coupled with the quality of the performances, kept the crowd on the edge of their seats (if not frequently on their feet). In my experience, this Friday night show rivaled the quality of many Saturday night shows. Hats off to Bahaia for reinventing the Friday night seminar experience and leaving me delighted to part with my ten bucks for a change. The success of the Friday night gala set the standard for the act to follow – the Saturday night All Star Show. With Morocco as the headliner, Bahaia was not content to let the show rest on the laurels of the international star. Instead, the dancers delivered a consistent stream of quality performances, equally engaging, yet surprisingly diverse in style. Bahaia obviously capitalizes on the dancers different qualities as a tool to keep the show exciting. I thoroughly enjoyed watching the luscious subtlety of Austin’s Debbie Smith contrasted with the fiery Bahaia or the ethnic styling of Fort Worth’s Aiqa Dance Company (complete with snake) followed by Pat Taylor’s modern Egyptian finesse. For me, there was never a dull moment; not a single dancer lost my interest. Morocco herself opened the show with a mezmerizing performance of the Moroccan Guedra, the Tuareg blessing ritual. Wearing traditional dress, she captivated the audience and calmed the rattled nerves of the dancers to follow. 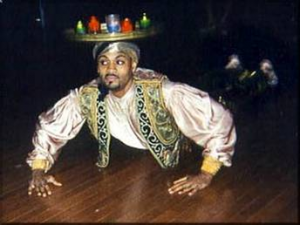 After a ritual greeting shared with several members of the audience, Morocco moved gracefully through both the standing (t’bal) and kneeling (guedra) portions of the ritual, creating a sacred space where both audience and dancer are reminded to celebrate life, and dance as an expression of it. Several of Austin’s favorites, as well as a number of very impressive dancers from other regional cities, comprised the body of the show. Evening highlights included a passionate duet by Austin’s Z-Helene and her drummer/husband Rick Fink. This dynamic couple took their repartee to new heights in a blaze of intensity and wit that brought the audience to their feet. The evening concluded with the incomparable Morocco. In a whirl of non-stop hips and flashing zills, she took command of the stage in masterful raks sharqi fashion, topping off the event with a lively, expressive performance. My first interaction with Morocco left me a bit intimidated. She arrived fresh from the airport, before the Friday night show. Passing through a dressing area, she met another dancer and me and enthusiastically described how her workshop would bust our butts. Visions of belly dance boot camp passed through my consciousness. The next day what I discovered was indeed a focused, consistent workout that started on time. Yet, Morocco was no barking drill sergeant. Instead, she remained accessible and responsive to any questions while keeping the workshop on track. Each morning began with a gentle, comprehensive warm-up to Doug Adam’s ”Beautiful Friend”. During the course of the warm-up, Morocco flagged certain moves and isolations as something we would see again, clearly preparing us for the days choreography. After the warm-up, Morocco devoted the first half of each day to choreography, while the afternoons featured other activities. Saturday afternoon consisted of a discussion and demonstration of the Guedra, and Sunday afternoon involved a mini-workshop on zills. 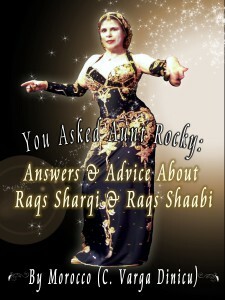 As a former modern and ballet dancer and a fairly new initiate into Oriental dance, learning from one of the grande dames of raqs sharqi offered me a unique challenge. One of the first points Morocco shared with us Saturday morning was that this dance form is a dance of the hips, not the legs. Although this wasn’t news to me, when I really concentrated on the physical implications, my body didnt quite submit. Just another humbling reminder that even the most basic concepts arent necessarily the easiest to assimilate. I took advantage of the almost constant hip work in Saturday’s choreography to ”Zey El Hawa” as a opportunity to focus my energy solely on my hips. The simplicity and classical quality of the ”Zey El Hawa” choreography was also a refreshing change for me, as my style is largely fusion. Sunday’s choreography to the pop hit, “Amouna fi Said”, continued to challenge my hip stamina with a little sass and fun thrown into the mix. For me, an ideal workshop focuses more on concepts and specifics of technique, rather than on choreography. Yet, Morocco managed to weave tips on technique, cultural anecdotes, and lyrical interpretation of the music, not to mention her relentless wit, into the process of teaching the choreography. Her methodology for teaching choreography involved breaking the piece down into reasonably sized portions. After learning portion A and executing it several times, you could tackle portion B, but you couldnt perform portion B without performing portion A with it. By the time you get to Z, you can perform portions A through Z with a fair amount of confidence. Although this approach sounds tedious, it helped me commit the choreography to muscle memory and gave me the opportunity to make the piece my own. The straightforward nature of these choreographs made the workshop accessible to several levels of expertise, and, as another dancer indicated, it leaves room for ones own embellishments. As an added bonus, Morocco detailed both choreographies in handouts and offered tapes of each musical number for sale at an extremely reasonable price. The highlight of the workshop was Morocco’s discussion and performance of the Moroccan Guedra on Saturday afternoon. The closet anthropologist in me was delighted to hear her firsthand account of her encounters with a Moroccan Berber tribe and the cultural significance of this graceful blessing ritual. Only women perform the Guedra, as they are the source of life-giving magic. The ritual itself is an affirmation of life, celebrating its essence in gestures and movements honoring the four directions, the four elements, drawing on the life force of Mother Earth, and the passage of time. Morocco also explained that the rhythmic clapping in the ritual echoes the beating of a heart. Following a detailed description of the ritual’s components and their meaning, Morocco performed the Guedra for us twice. During the first round, we were asked to watch, while during the second, we were invited to join her. Even in the most sterile workshop environment, it was deeply moving and equally inspiring. What I appreciate most about Morocco is the breadth of her experience. 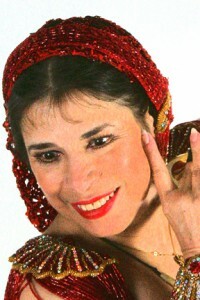 She has devoted herself to gaining firsthand knowledge of various Middle-Eastern cultures and their impact on Oriental dance. The result is a virtual gold mine of information, much of which she has gone to great lengths to acquire. Morocco tells a charming story about learning dance steps in the ladies room of a Middle Eastern restaurant under the tutelage of a grandmother from the old country. And then, there is the tale of a very young Morocco in the guise of a deaf/ mute making her way across Morocco to witness a tribal birth in the Berber nation. Her passion and amiable teaching style coupled with Bahaia’s commitment to producing quality seminars offers true bang for your buck. The result was a rich seminar experience.